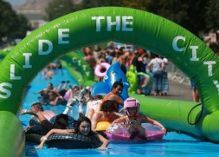 Market Street turned into one big water slide over the weekend and boy was it fun! The heat was just enough to make the waterslide lots of fun! We arrived and jumped right down the slide and did it just a couple of times and that was enough for us! A portion of the event proceeds will be donated to Saint Louis Area FoodBanks- It was all for a good cause. There were tons of people, lots of sliding, fun music, good food and a nice time. Of course, I didn’t bring my phone for fear of it getting wet and ruined on a water slide, but here are few of the fun photos that happened that day. 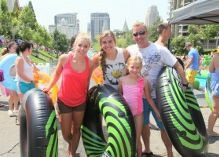 Thanks for having us Slide the City!